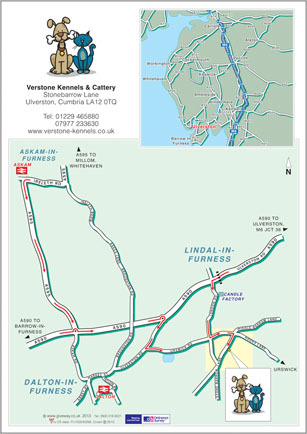 We are situated mid-way between Ulverston, Dalton and Barrow in Furness, near the small Furness villages of Great Urswick, Stainton & Lindal. All visitors are welcome. To keep disturbance to our residents to a minimum visits must be strictly by appointment. Leave the M6 Motorway at Junction 36, heading on the A590, signposted towards South Lakes & Barrow-in-Furness. After travelling approx. 24 miles you arrive at Ulverston. Continue towards Barrow-in-Furness, through Swarthmoor and in to Lindal-in-Furness (Please do not confuse Lindal with Lindale!). At the cross-roads, immediately after the pedestrian traffic lights, turn LEFT towards Urswick & Candle Workshops (Wax Lyrical). Travel approx. 1/2 mile to the next cross-roads, turn LEFT, signposted towards Urswick. Travel 1/4 mile to the next cross-roads, turn RIGHT, signposted towards Stainton & Skells Lodge – we are 400yds from this junction, up a slight hill, on the left hand side!